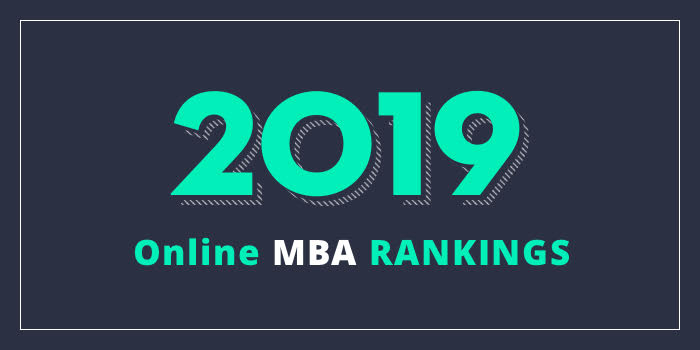 Our 2019 list of the Top 50 Online MBA Programs in the US. For an explanation of ranking criteria, click here. Students in this 52 credit hour program will “do more than read case studies about top brands, such as Disney, Starbucks, and Warner Bros.” Students “will actually work” with top executives on” live consulting projects” to “solve real-time challenges.” Other program highlights include the Personal and Leadership Development Workshop residency, which takes place at the schools’ coastal Malibu campus, Global Business Intensives, which cover relevant topics such as international economics, culture, marketing, finance, and business law, and five in-demand concentration options including Digital Innovation and Information Systems, Finance, General Management, Leadership and Managing Organizational Change, and Marketing. An optional international residency that allows students to explore global issues and work with international experts to understand foreign markets is also available. The Raymond J. Harbert College of Business at Auburn University offers a video-based Distance MBA that may be completed in 2.5 years, part-time. The 36 credit hour program offers an optional three-day orientation at the beginning of the program and a three-day on campus residency on the Wednesday, Thursday, and Friday before graduation. Otherwise, all coursework for the program is delivered through the University's online student learning platform CANVAS. Students use CANVAS to view lectures, work with team members on group assignments, ask questions and hold discussions with professors and classmates, submit homework, and access course materials. The lock-step curriculum allows online students to watch the exact same lectures, take the same tests, and communicate with the same professors as on-campus students. The Martin J. Whitman School of Management at Syracuse University offers a 54 credit hour online MBA known as [email protected]. The program consists of 36 credits of core business courses, 15 credits of specialization-focused electives, and three credits of U.S. and global residencies. Students may choose from six optional specializations including Accounting, Business Analytics, Entrepreneurship, Finance, Marketing Management, or Supply Chain Management. The Neil Griffin College of Business at Arkansas State University offers a 33 credit hour online MBA program that requires 36 to 39 credit hours to complete. Six concentrations are available and include Finance, Healthcare Administration, International Business, Management Information Systems, Marketing, and Supply Chain Management. Students in all concentrations have the option to complete an internship worth three credit hours or one directed independent study. According to program literature, the curriculum emphasizes leadership/values, international business, latest technology, decision tools, and social responsibility/ethics facilitated by action-based learning. The school also says that a “serious trademark” of the Neil Griffin Online MBA is the same faculty members that teach and mentor the College of Business’ on-campus courses are the instructors for the online program. The AACSB-accredited online MBA program at Arkansas State University takes just two years to complete. The College of Business at Mississippi State University offers a 30 credit hour fully online MBA and a 33 credit hour online MBA with a Focus in Project Management. Online MBA courses emphasize Management, Marketing, Finance, Economics, Business Information Systems, and Quantitative Analysis. Both AACSB-accredited programs offer enrollment in fall, spring, or summer and they typically take two years to complete. However, students who have completed all undergraduate prerequisites can finish either program in as few as 18 months. Prerequisite courses are also available online. The College of Business at the University of Nebraska-Lincoln (UNL) offers a 48 credit hour MBA that’s delivered entirely online. The school also offers a Flex MBA program, which is a blend of both on-campus and online courses. However, the majority of courses are taken on-campus at the “renowned” Howard L. Hawks Hall, which opened in 2017. Per UNL, for the 100% online MBA program known as [email protected], students “will never have to come to campus, which makes this option the most flexible” of the school’s three MBA programs. The program includes 10 core classes (30 hours), nine hours of breadth electives, and nine hours of electives. Specialization options include Agribusiness, Business Analytics, Finance and Marketing, International Business, and Supply Chain Management. Online graduate certificates are also available in Business Analytics, Supply Chain Management, and Survey Research and Methodology. In addition to the option to choose a specialization or certificate, UNL Online MBA students are expected to participate in an internship. “Internships are designed to give students practical experience in managerial and/or administrative situations.” Students can participate in a maximum of two internships and earn three hours of elective credit for each internship, for a maximum of six hours. Start times for the [email protected] program are January, March, June, August or October of each year. The average completion time for the program is three years, but it is possible to complete it in 1.5 years. However, students are allowed up to 10 years to complete this AACSB-accredited program. Watson Graduate School of Management is home to Spears School of Business at Oklahoma State University (OSU), which offers two MBA programs. Options include a 42 credit hour part-time MBA, and a 43 credit hour full-time MBA. Concentrations for both programs include Business Sustainability, Data Science, Energy Business, Entrepreneurship, Global Marketing, Human Resource Management, Information Assurance, Marketing Analytics, and Non-Profit Management. Both the part-time and full-time Spears OSU MBA programs may be completed online. The College of Business at Colorado State University (CSU) offers a Professional MBA Program that dates back to 1975 when the first “distance” offering was introduced. Today, the 40 credit hour program is offered 100% online and it offers the opportunity to focus in one of several areas including Computer Information Systems, Finance, and Marketing Data Analytics. Students may also choose to focus in “Professional Enrichment,” which consists of electives such as International Study Trip (summer) and Contemporary Issues in Business: Leadership Symposium: Building and Leading Exceptional Organizational Teams. During the optional International Study Trip, students will meet with business leaders, “learning international business culture, and becoming acclimated to environments” different from their own. In addition to the study trip and several focus areas, the CSU College of Business offers a number of unique business certificates to complement the MBA program. Options include Accounting, Ethics and Auditing, Applied Finance, Business Analytics and Accounting Systems, Business Information Systems, Business Intelligence, IT Project Management, Marketing Management, Nonprofit Administration, and Ski Area Management. Including the focus area and study trip, students can expect to complete the AACSB-accredited online MBA program in as few as 21 months. However, students have the option to take up to five years to complete the program. The Alfred Lerner College of Business and Economics at the University of Delaware (UD) offers an AACSB-accredited MBA that may be completed entirely online in as few as 16 months. A hybrid option is also available. The program has five concentrations including Business Analytics, Finance, Health Care, International Business, and Strategic Leadership. Students in the program may also choose multiple concentrations (two or more) to “gain greater flexibility in the job market, says the school” and stand out from the crowd. The School of Business Administration at the University of Mississippi (Ole Miss) offers a 36 credit hour Online Professional MBA that can be completed in as few as two years. The program “employs a fully supported online learning system integrated with features such as video conferencing, interactive discussions and similar collaborative technologies necessary for effective online instruction,” says the school. Course titles range from Managerial Accounting and Organizational Behavior to Contemporary Business Analysis and Mobilizing Technology. The Ole Miss Online MBA is AACSB-accredited. The School of Business Administration at Portland State University (PSU) offers an Online Healthcare MBA in partnership with Oregon Health and Science University (OHSU). The 72 credit hour program, which can be completed 80% online and 20% in-person, “provides students the flexibility to complete an MBA while working full-time,” says the school. In-person classes are held at Oregon Health & Science University, take place two Fridays and Saturdays per term. The program focuses on six thematic areas including Understanding the Healthcare Industry, Leadership and Management in Healthcare, Financial Management Healthcare, Operations and Quality in Healthcare, Marketing, Business Planning and Strategy, and the Application Projects and Capstone. Designed for working professionals, the PSU Online Healthcare MBA attracts students from all locations and healthcare roles including doctors, dentists, nurses, clinic managers, lab specialists, nurses, dietitians, and medical technologists. As part of Portland State’s School of Business, the PSU MBA is AACSB-accredited and it may be completed in just 33 months. The Jesse H. Jones Graduate School of Business at Rice University offers an AACSB-accredited online MBA program known as [email protected]. Per the school, the program develops students’ understanding of “essential business principles such as financial accounting, business analytics, marketing strategy, leadership and finance.” Students will “learn to apply these larger concepts throughout an organization” as they hone their skills in a focused specialization of study. The D'Amore-McKim School of Business at Northeastern University offers an AACSB-accredited online MBA program that can be completed 100% online in as few as two years. Coursework for the 50 credit hour program is divided into 13 core courses and five electives. Eight in-demand specialization options are offered including Finance, Healthcare Management, High Technology Management, Innovation Entrepreneurship, International Management, Marketing, Supply Chain Management, and Sustainability. Creighton University is home to the Heider College of Business, which offers an MBA program that can be completed in just over two years. Three delivery options are available including completion of courses online, on campus, or a combination of the two. This 33 credit hour program offers several MBA concentrations, the option to add a graduate certificate or a dual degree in addition to the MBA. Concentrations include Accounting, Business Intelligence & Analytics, Financial Psychology & Behavioral Finance (also a certificate), Finance, Leadership, and Personal Financial Planning (also a certificate). The College of Business and Global Affairs at the University of Tennessee at Martin (UT Martin or UTM) offers a 33 credit hour online MBA program that is designed for individuals with an undergraduate degree and at least two years’ work experience who are seeking to advance their careers. The cohort-based program provides focus through a series of 6-8 week courses. Courses for the 20 to 21 month cohort are delivered sequentially and include Banking and Financial Services, Corporate Financial Management, Legal and Ethical Environment of Business, Organizational Theory and Design, and Strategic Management and Business Policy, to name a few. Trips to the UT Martin campus are not required, so all interaction between the programs diverse group of students and faculty takes place via discussion boards, email, virtual classrooms, and virtual group meeting rooms. Other assignments and exams are completed and submitted online. This AACSB-accredited program emphasizes that it has just 20 students per cohort “to keep each other motivated.” Students typically begin the program in January or June.